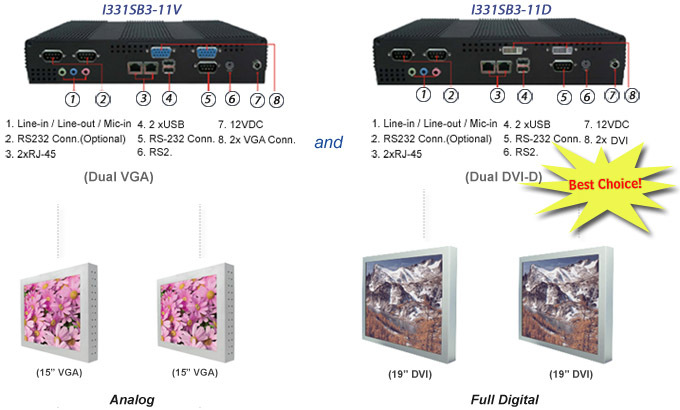 Winmate is the first to provide dual VGA/dual DVI-D BOX PC solutions. Winmate's "Dual Display BOX PC" series support a wide range of application, such as Digital Signage, Financial, Transportation and Industrial Automation. During economic recession, Winmate's Dual Display series BOX PC series is the best choice for effectiveness and performance. Most dual displays box pc of the market only provide 1 VGA Port and 1 DVI-D port. Sometimes it is not convenient to prepare displays with different input signal connectors, one VGA and the other DVI. All in one design for dual VGA or dual DVI support. Resolution up to 1600 x 1200 in Clone Mode and 3200 x 1200 in Extend Mode. Winmate Dual Display BOX PC can support in Clone Mode and Extend Mode. In Clone Mode, Winmate Dual Display BOX PC will support the same content in screen resolution up to 1600 x 1200. In Extend Mode, the 2 displays can also have different resolution, it will support on overall resolution up to 3200 x 1200. Winmate Dual Display BOX PCs is designed to satisfy most of the applications in the industrial computer market, Transportation, Digital Signage, Financial and Industrial Automation. It is a compact design to meet the demanding performance requirements of today's business and industrial applications.